That's no uniform. But the cut of clothes where all very similar in the 17th century. Only colours where different and maybe the material and patterns if you are wealthy enough. 1 not changing in form or character; remaining the same in all cases and at all times: blocks of stone of uniform size | the decline in fertility was not uniform across social classes. • of a similar form or character to another or others: a uniform package of amenities at a choice of hotels. I find it very hard to believe (and contrary to my research) that civilian clothing designs were more similar in the 17th century than they are today. For one, how come most of the other nations in the game have wildly different clothing patterns within the same unit? One should think following the latest fashion would be much easier in Gdansk than inside the Zaporigian Sich. 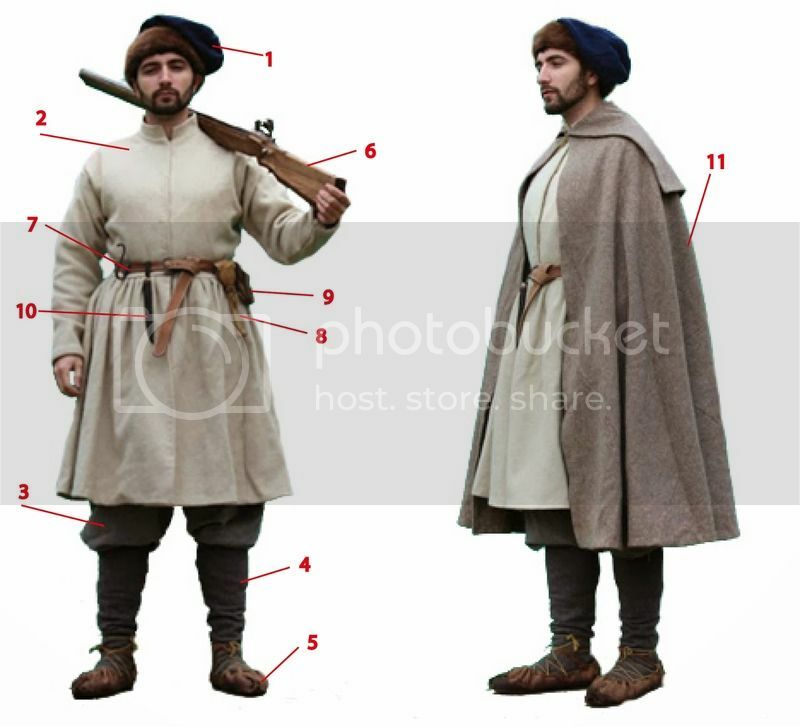 These clothes appear to have come directly from the same tailor, using the same pattern, coat lenght and number of buttons; the only difference is that the dismounted versions have a stand-and-fall collar. 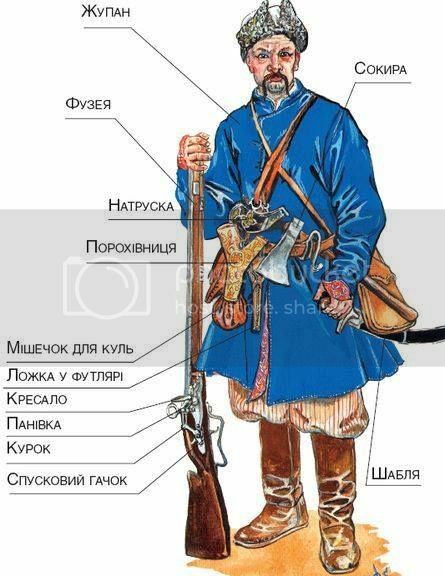 This would make sense for registered cossacks, but not for people gathered from all over Ukraine for a rebellion. Actually they are very similar and almost indistinguishable in 15mm scale. At least between Poles, Cossacks and Transylvanians/Hungarians. You have trousers which could be baggy (PLC and Cossacks) or slim (PLC and Transylvania). And a coat which could be knee length or longer depending on wealth. PLC's żupan tends to have puffy upper sleeves and slim lower sleeves whole Transylvanian dolmans have the flaps which covers the back of the hands (dog's tongues) more in the shape of duck's feet or circular while PLCs are rather round or pointy. Cossack's Siermięga doesn't has this flaps or very small ones. All have high collars. Everyone used fur brimmed caps. The Transylvanians later than the others. PLC caps tend to have no flaps while Cossacks usually have flaps of varying length. Same for Transylvanians but they also can be standing up instead of hanging down. Transylvanians also have various styles of felt caps. But the cut of the basic coat is very similar. Over this you could put a kontusz or delia but especially th elastone is more for nobles and the first one for PLC infantry. Western Europe is not so different with trousers, doublet and wide brimmed hat. What I find a bit bad is that the models are so "clean" Alls they have as equipment is a belt on the hip where the saber and bullet pouch is fixed. That's all. Where is the (eastern style) powder horn? Why bullet pouch at the hip belt and not across the shoulder? Just look at the Registered Moloitsy how much stuff they are carrying around. Even a priming flask made from antler could be visible in this scale. A bag slung over the shoulder with personal belongings is also a possibility. The Moloitsy on foot also suffer from this "cleanness". I got to agree with Callan, the figures are nice but they lack diversity in clothing. Not one bare head, and everyone is wearing zupans. Would love to see some kontuszes, or just shirts and pants, or an occasional kontusz sash. I guess the coatless- cap-less Cossack with a sash is just a 18th century myth. 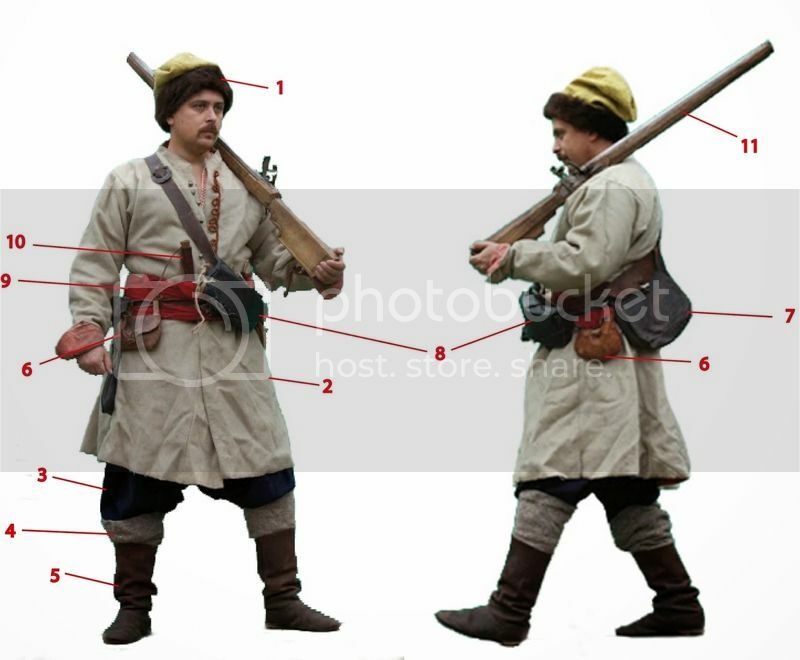 Historical Cossacks looked more like this. I was just saying that it would be good to see some more model diversity. For example, the kushak/red sash as seen on one of the reenactors could have been added. The last picture is a poor copy of drawing from a Ukrainian book, "Ukrainian Infantry of the Hetmanate from xvii" by Shemenkov (writing from memory so surname could be wrong). The book shows a range of different clothing types, winter and summer clothes etc. Did Cossacks always wear hats? 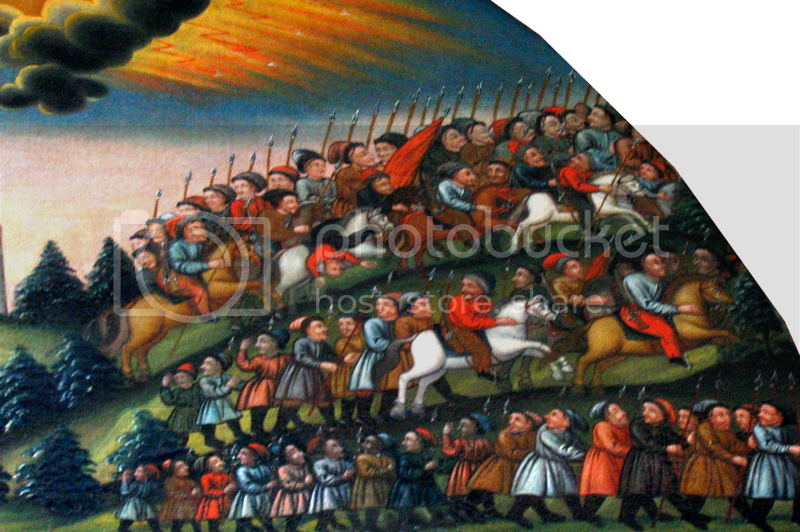 Have a look at the relief on the tomb of John II Casimir, first line of Cossacks look bearheaded. Berestechko was fought in the middle of summer. Anyway, I like the new models hopefully they mix ok with the old old ones. I guess the coatless- cap-less Cossack with a sash is just a 18th century myth. I've stated my case, think I'll bow out from this discussion before it reaches even higher levels of absurdity. Small Ice Age is a term you are familiar with? The 17th century was colder than today. And yes seeing ordinary people in summer clothes is surprisingly rare in sources of the 17th century. But winter clothes I know of (as well as medieval paintings of peasants doing field work just in underpants). I'm puzzled by this by myself. But on the other side: I do reenactment and 40°C with long sleeved woollen clothes and fur cap (see my profile picture) is uncomfortable but not unbearable. Also it protects a bit against cuts. I'm sorry and I apologize if I appear lecturing or I'm-more-knowledgeabel-than-you, etc but this is not my intention. That's just my personal experience and my sources. If you (or anyone) have different ones I would be very glad to know them. Common sense says one thing but sources which I know don't show it. It's easy to flag something as absurd just because it doesn't fit what you think *should* be the case. @clothes in summer, this is a well documented case wide into the 20th century also further west and has a simple reason: Unless you own a home, what you own you carry with you. What you leave somewhere, you essentially give up. As a regular cossack, just as a wandering carpenter in the Alsace or the ex-merc somewhere between Breslau and Dresden, you won't be buying a new coat every winter. So yes, plain and simple, you carry it all year round. There is no absurdity whatsoever, just as there is no air conditioning. Just for my calculations...which new models will be available at the tactica hamurg?